Las Vegas, Nevada (March 27, 2017) – The world’s most famous movie palace, the TCL Chinese Theatre in Hollywood, has long been an innovator and is constantly making the entertainment experience bigger, better and more engaging for their customers. They created the world’s largest IMAX theatre years ago and soon followed with the addition of the IMAX with Laser technology. Now the legendary, 90 year-old theatre, famous for its red carpet movie premiers, movie star handprints and footprints, is planning to launch the industry’s most advanced sports theater in its adjacent Chinese 6 Theatre complex. The theater will function both as an MX4D Motion EFX movie theatre, as well as serve as the first immersive spectator theater hosting competitive sports tournaments and provide a launch pad for a network of tournament theaters beyond Hollywood. “MX4D Motion EFX theaters will provide our customers with a unique and immersive cinema experience” says Alwyn Hight Kushner, president and COO of the TCL Chinese Theatres. Enjoy an industry first esports experience as your MX4D seat rolls and tilts in a heart-pounding clash between world class teams. Feel the action as competitors bash, smash, maneuver, shoot, blow-up, and knock down a competitor all the while racking up points leading them to victory. Away from the tournaments, movie goers are also in for a special surprise. 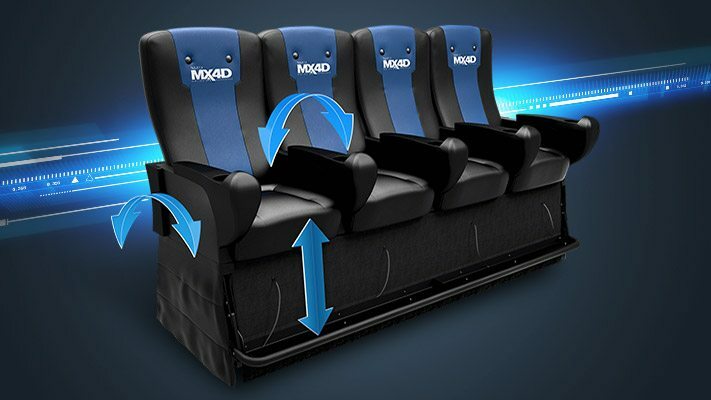 Each MX4D theater seat moves in sync with the movie action and special effects in the cinema, allowing you to “feel” the movie’s motion, jolts, pokes, wind, water, even scents. MX4D is MediaMation’s uniquely branded “4D” motion and special effects (EFX) system. The motion and effects are programmed to both sync with and enhance the action on the screen for a more exciting and realistic movie-going experience. In general, 4D refers to a new “immersive” cinema technology which allows moviegoers to experience big Hollywood “blockbusters,” as well as locally produced major films. The MX4D seat EFX features the addition of moving seats, air/water blasts, leg/neck ticklers, fog, seat/back pokers, seat rumblers, and other special effects such as smoke, snow, rain and more. Esports (also known as eSports, e-sports, competitive or pro videogaming) is a hot, if not the hottest, new form of competition that is played on personal computers, consoles (i.e. Xbox and PS4) and mobile devices. Esports teams have moved into professional status with contracted teams and players receiving sponsorships and endorsements while participating in online and live tournaments where they compete for large cash prize pools. Since 1927, The TCL Chinese Theatre IMAX has been the home of the most important, star powered red carpet movie premieres and special events, where Hollywood’s biggest and brightest talents have come to watch their movies. The most famous movie theatre on the globe is world-renowned for its unique forecourt of the stars, featuring cement hand and footprints of major movie stars, from Marilyn Monroe to Brad Pitt, and numerous stars from all eras of Hollywood. In 2013, the main theatre was relaunched as the world’s largest IMAX theatre. Six additional theatres, The TCL Chinese 6, are part of the Hollywood & Highland complex. 18,000 MX4D immersive EFX theater seats are in use in 160 cinemas worldwide. For 25 years, MediaMation, Inc. has provided innovative technological solutions to the entertainment market. MediaMation is an interactive technology company and a worldwide, leading supplier and manufacturer of patented technology for 4D/5D motion EFX theaters and seats, including its MX4D® Motion EFX technology. MMI also designs and implements turnkey creative solutions for complex shows, rides, exhibits, fountain shows, etc. for theme parks, zoos, aquariums, museums, cinemas and FECs. For more information, visit www.MX-4D.com, follow @MediaMationMX4D on Twitter or MediaMation, Inc. on LinkedIn.